SSD = Telsa Model S. Normal HDD = furniture truck. My Windows 10 PC was running unreasonably slow in February 2017. It was only a year old, so usually I would do a format reinstall, but instead I bought a 1Tb Intel SSD hard drive and did a fresh install of Windows 10 onto the new SSD drive. Windows boot time went from 2 minutes to 8 seconds. Yes. 8 seconds from the Bios beep until login screen. Everything installs, opens and runs 10 times faster. Feels like a new PC for a fraction of the cost. I love my PC again. Windows start up times have been a joke for many years. Unfair comparisons with ipads and phones. But then you use an SSD. And Windows boots like it should have all along – fast! Infact its boot time can give my ipad a good run for its money. So Why Isn’t Everyone Using SSD Drives? Cost – but that is coming down. Capacity – but that is going up. Limited life – not as much of a problem anymore. My new Intel SSD came with a 5 year warranty! Expensive. Sort of. February 2017 my 1Tb Intel SSD cost $450 AUD. A 1Tb normal hard drive is about $100 – maybe a bit less. That’s five times dearer for ten times the performance. A bit pricey, but I consider that reasonable for a performance desktop or laptop. Teslas aren’t cheap either. Small capacity. Like trying to fit a piano in a Tesla. SSDs are getting better though. 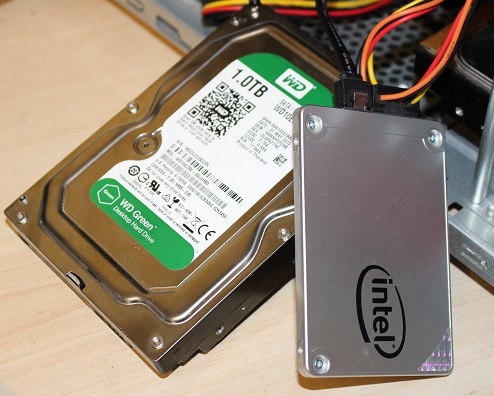 1Tb is OK for a boot drive, basics programs and vital data. I have another 6Tb of normal hard drives installed in my PC for the rest. Some cheap vendors are still selling laptops with 32Gb SSD hard drives as the only drive. I have USB sticks bigger than that! But if you need lots of Tb, normal drives are the way to go. Or do what I do and run both SSD for the speed and normal hard drives for the bulk storage. You can drive a Tesla and a furniture truck at the same time. Crazy fast. Ignore the numbers of data transfer speeds and all that. Try one out. The MS Surface is one of the quickest because it is all Microsoft ans optimised for Windows 10 and the BIOS hands over straight away. On my desptop the BIOS has a think for a while (yes, there are ways of speeding that up), but once the SSD is called on, it answers pronto. You need SATA 3 to take advantage of the full SSD speediness, so not as much point in an older PC. SATA3 has been normal for a few years now. Use less power. Because no spinning disks. No moving parts. Less noise too if you have a really quiet office and sit with your ear to your computer. SSD makes no noise – like Teslas. Better for bumps. Because no spinning disks = no hard drive head crashes. No moving parts. Great in desktops, brilliant in laptops. More reliable. No spinning disks! Yes, There is a limited number of times you can write to each sector on an SSD before the sector dies. Current drives survive a lot longer, and they are smart enough to map out any failing sectors before you lose your data. And Intel gave me a 5 year warranty! As a computer guy, I can’t count the number of times I’ve had a customer lose data because their hard drive has failed (and they had no backup). Hard drives are the most critical part of a computer – you can replace a CPU, but you can’t replace your data – yet hard drives are usually the first part of a computer to fail. Why? Spinning discs! SSDs have no spinning discs and are a lot less likely to fail. Yes, you should do backups. I have backups of backups of backups, but I’m a little paranoid (after seeing so many people lose data), and you should back up to the cloud too. But it is still a major pain when a hard drive fails – there is always something not in the backup (like some obscure AUSkey digital certificate in the AppData folder). SSD = less failure! Don’t defrag! Going back to the data only written a certain number of times, don’t defrag. Running a regular defrag used to be a thing, but I don’t know anyone who still does this. If you still do defrag, don’t bother with an SSD. If you want to check out the performance of an SSD before you buy one, try out a Microsoft Surface Pro in a store. I own one and it is easily my favourite laptop ever. Even better than my Macbook Air. And with an i5 CPU and an SSD, MS Surfaces are lightning fast. And your desktop can run like that too.